I’ve created a landing page for material related to my QU33R anthology story. It now includes the current version of page 1 (pencils, as of this posting), as well as my character designs for the female versions of Prowl, Jazz, and Bluestreak. While these specific images are not technically part of the story that’s going to be published in QU33R, they are are finished art pieces in their own right and I wanted to show ’em off to ya. I used these designs for the actual drawings of the three lady bots that show up in the story. If you want to learn more about how I created these designs, click through to their individual pages and read the mass of text below the image. Oh, and you may have noticed there are little “Buy Now” buttons on there as well, just in case you are so smitten by the girl incarnations of Prowl, Jazz, and Bluestreak, you feel yourself needing to own a print of them. Next week I’ll be tabling at the Dallas Sci-Fi Expo with my Feeping Creatures menagerie, but I’ll also have the TransTransformers prints with me. So if you are going to be in Dallas, you might stop by and peep them in person. 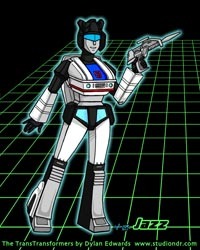 Next week I’ll be bringing you some more new art, to wit: the character designs I created so we can see what Prowl, Jazz, and Bluestreak look like as girls. Until then! I’m working away on pencils for my story for Robert Kirby’s QU33R anthology, due out this fall from Northwest Press. As you can see, I have contrived to tell a story about playing with Transformers as a kid, which means I get to draw quite a few of the ol’ robots for this comic. It’s actually a little difficult to find the photo references I need, believe it or not. I’ve had to resort to watching the cartoon (which was really just not very good at all, thought I still kind of love it in that important-part-of-my-childhood way) and grabbing the occasional frame. I want to use the cartoon character designs specifically (as opposed to the comic book Transformers, or the box art for the toys) because that’s what most informed my impression of what the characters were supposed to look like. Also, the art style fits well with my own cartooning style. I do all of the penciling by hand, even though I’m pretty sure that proves I’m insane. 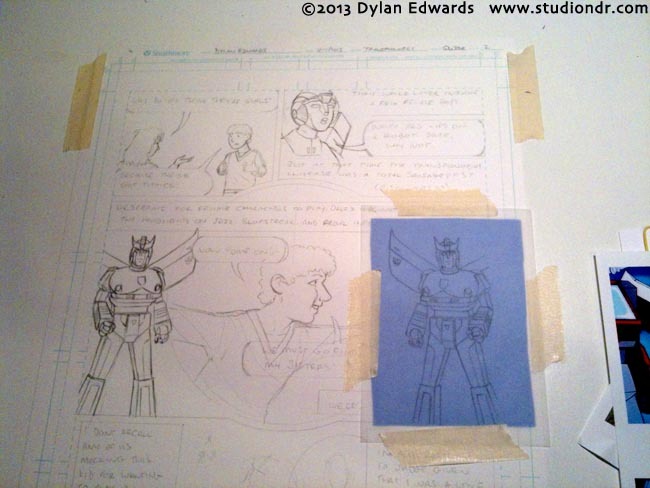 So, for example, I need to repeat that drawing of Prowl on the left, so I copy him onto vellum, position the copy where I want it, then transfer it using erasable, non-photo blue carbon paper. Why do I do this instead of just making a duplicate layer in Photoshop like a normal person? Because I want each page to be a finished work of art in its own right, and that means keeping digital manipulations to a minimum. Tune in next week for a glimpse at a (readable) sample page, and after that I have some character design work to show off. In other words, I’m talkin’ about regular posting for awhile. Cue dramatic music! New Politically InQueerect strip! QU33R anthology! New Politically InQueerect strip! QU33R anthology! published on January 2, 2013 Read more posts by the author of New Politically InQueerect strip! 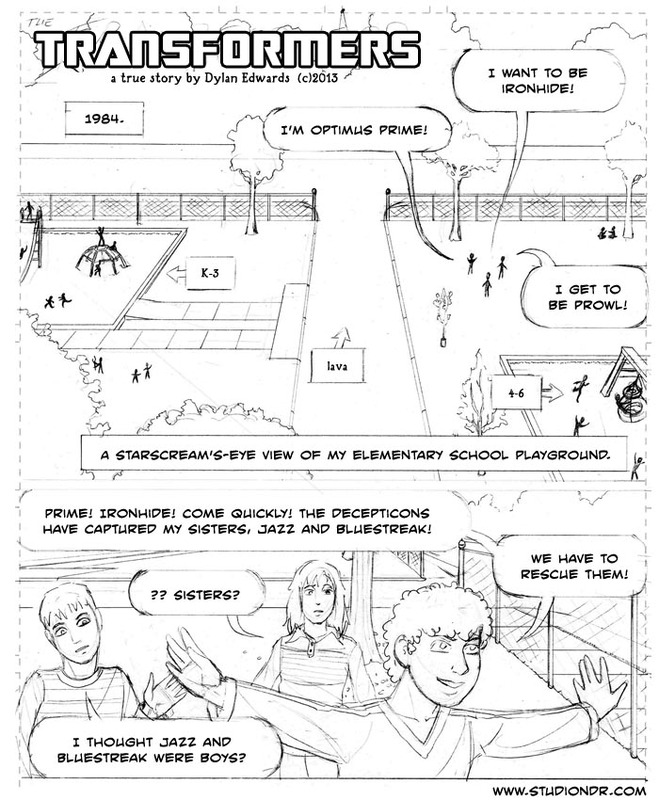 QU33R anthology!, Dylan EdwardsNo Comments on New Politically InQueerect strip! QU33R anthology! As I mentioned a few posts ago, I drew up an all-new Politically InQueerect strip for Rocksalt Magazine, and it’s now available online for your reading pleasure. I will eventually make the strip available here with all the other PIQue stuff, but if you cannot wait and must have it now, point your cursors and your eyeballs at that link. At the moment I’m working on a short story for Robert Kirby’s new anthology, QU33R, which he talks about in a bit more detail on his blog. The story will be exclusive to the anthology, but over the next few weeks I’ll be posting some concept art and character designs here for your edification. More on that soon!